Sharpless 2-106 as imaged by the Gemini Multi-Object Spectrograph on the Gemini North telescope on Mauna Kea in Hawai‘i. 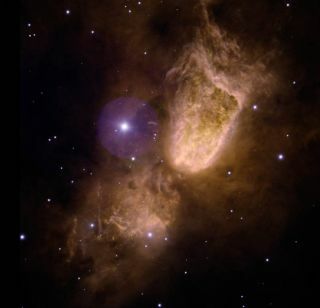 This color composite image shows the nursery of a massive star (hidden within the cloud) obtained with four narrow-band optical filters available for Gemini users at both Gemini North and South. A dramaticnew image from the Gemini North telescope, on Mauna Kea in Hawaii, illustratesthe dynamic and sometimes violent process of star birth. It also demonstratesthe capabilities of new filters available to researchers using the GeminiMulti-Object Spectrograph (GMOS). Thehourglass-shaped (bipolar) nebula in the new Gemini image, known as Sharpless2-106 (Sh2-106), is a stellar nursery made up of glowing gas andlight-scattering dust. The material shrouds a natal high-mass star thought tobe mostly responsible for the hourglass shape of the nebula due to high-speedwinds blowing more than 200 kilometers/second, ejecting material from deepwithin the forming star. Research also indicates that many sub-stellar objectsare forming within the cloud, which may someday create a cluster of 50 to 150stars. The nebulalies about 2,000 light-years away in the direction of the constellation Cygnus.It measures about 2 light-years long by 0.5 light-year across. It is thoughtthat its central star could be up to 15 times the mass of our Sun. The star?sformation likely began no more than 100,000 years ago, and eventually its lightwill break free of the enveloping cloud as it begins the relatively short lifeof a massive star. The newfilters provide valuable insights by transmitting very specific colors ofvisible light emitted by excited hydrogen, helium, oxygen, and sulfur, asradiation from hot young birthing stars energize clouds of gas and dust. Thefilters are also used to study planetary nebulae and excited gas in othergalaxies. For thisimage four colors were combined as follows: Violet — helium II filter; Blue —sulfur II filter; Green — oxygen III filter; and Red — hydrogen-alpha filter.Each filter was integrated for a total of 900 seconds. The seeing was 0.4arcsecond RMS. The rotation of the image is 125° CCW from north up, east to theleft and the field of view is 3.87 arcminutes on each side. The image was obtained using the Gemini Multi-ObjectSpectrograph on the Gemini North telescope. An identical instrument and filterset is available at the Gemini South telescope in Chile for parallelcapabilities on the southern sky.